The Harris RF-5710 HF Modem, nomenclatured MD-5077(V)3/U, is a compact unit having the ability to generate the following HF waveforms using the same hardware: MIL-STD-188-110A Serial, Frequency Shift Keying (FSK), North Atlantic Treaty Organization Standard Agreement #4285 (NATO STANAG 4285), and NATO STANAG 4529. All waveforms and their variables are selected by front-panel controls. User menus, prompting, and operational status of the modem is indicated by a front-panel mounted liquid crystal (LCD) display. Full remote control capability is provided by an RS-232C interface and can be accessed from any ASCII terminal connected to the modem's remote control port. For future improvements, the modem is Firmware upgradeable. The single (serial) tone mode is based upon Phase Shift Keyed (PSK) modulation at a constant rate of 2400 symbols per second. It is a full MIL-STD-188-110A serial tone compatible mode. Known data segments are periodically inserted in the transmitted signal to allow for adaptive channel equalization at the receiver. Harris was the original inventor of the HF single tone demodulation technique and holds patent rights to the "Data Directed Equalization" technique. Convolutional coding (1/2 rate) and Viterbi decoding are combined with interleaving to provide unequalled performance in HF channels. Data rates of 75 to 2400 bits per second (bps), and 4800 bps (uncoded), are provided. Automatic bit rate detection and correction are provided in receive mode. Lastly, a very robust adaptive Narrowband Interference (NBI) filtering algorithm allows data reception on channels with severe interference. The NATO STANAG waveforms conform to the North Atlantic Treaty Organization Standard Agreement requirements. Information regarding these specifications should be directed to NATO STANAG documentation. The Frequency Shift Keyed (FSK) mode of operation is provided for compatibility with existing modems. User selection of mark and space frequencies over a range of 50 to 5995 Hz in 5 Hz resolution are accommodated. The binary FSK waveform is implemented with digital signal processing (DSP) techniques. The interface support both Synchronous or Asynchronous data connections and the modem allows for half and full-duplex operation in most modes. 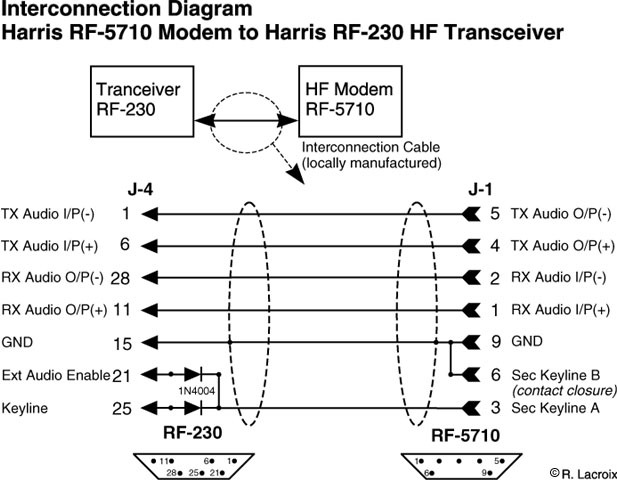 Connection of the RF-5710 HF Modem to the Harris RF-230 HF Transceiver will require the user to locally manufacture an interface cable as shown in the schematic bellow. You will require a suitable length of 5 conductor shielded cable to assemble the interface cable. It is highly recommended that a 8 post (minimum) terminal strip be used at the RF-230 end of the cable to facilitate the installation of the 2 1N4004 diodes. The terminal strip will also provide a mean for "test points" and the addition of a SPST switch for transmit on / off function if it may be required. (See Note #1 bellow for additional information on the transmitter control function.) Both the RF-230 and RF-5710 contain transformer coupled audio input and output providing for isolation and balanced 600 ohms operation. It is thus important that the correct audio pins (high & low) be correspondingly connected to ensure that the audio phase remains proper across the network and at all stations. IMPORTANT! When counting pin numbers on the RF-230 J4 connector, with the rear of the transceiver facing you, J4, Pin #1 is located at the far right hand side, in the upper row of the connector. Refer to the connector orientation pictured on the schematic diagram bellow. The communication program utilized with the RF-5710 modem must support the toggling (on/off) of the RS-232C RTS line as the transmit on / transmit off control function. If the communication program does not support this function, the modem and the transceiver will be in a permanent transmit state. Regular terminal communication programs are inadequate for use with radio modems. You must use a terminal communication program designed for radio interfacing. In the event that this is not feasible at your facility, the user will have to change the modem set-up parameter KEYLINE from RTS KEYS XMTR to UNKEY XMTR. In this case, the addition of a SPST switch will have to be inserted in series with the input of J4 pins 21 and 25 (after the diodes) on the RF-230 side of the interface cable. With the switch configuration, the user will now have to manually key and unkey the transmitter before sending or receiving data. Refer to the Harris RF-5710 manual (p/n 10447-0020-001) figure 3-10 SET-UP OPTIONS Menu (pages 3-19/3-20) and item 3.8.8 SET-UP Keyline (page 3-23) for additional information. NOTICE: An error in the pinout configuration of the interface cable was previously published (prior to February 11, 1999). Please update your documents and installations to reflect the following changes. J-4 pin 9 should be changed to J-4, pin 28. All of the RF-5710 modem software switches are set by the front panel push buttons with the aid of the LCD display. Please pay attention the the notes bellow prior to making any mode or setting selections. Not all computer RS-232C ports support slow and irregular data speeds (i.e. 50 and 75 bps), it may be required to set the computer (DTE) and communication software's RS-232C data communication rates at a speeds greater than the desired over-the-air modem transmitting and receiving data rates. The RF-5710 modem will buffer all input and output data sent and received from the computer. Tests have proven that bit errors in the transmission and reception of FSK data may occur if the communication software is set for rates of 50 or 75 bps. If bit errors are a problem, try setting your communication software and DTE settings in the modem to a 'standard' baud rate. Ensure that the settings both identical. The software and DTE settings in table 1a are suggested for all FSK modes of operation and settings in table 1b are suggested for all serial modes of operation. NOTICE: See table 2 and table 3 for modem set-up information. Your modem configuration will have to be changed in accordance with table 3 if you are transmitting Baudot or ASCII alphabet. Baudot is used for the FSK modes and ASCII is used for the serial modes. Remember that your software and modem configuration must be identical. At this point, I know that you are thinking "Instead of changing data formats, why not just leave it in Baudot and save my self a bunch of trouble?" A valid question but, the answer is that if you want to use the SERIAL or STANAG modes to transmit FAX or images etc..., you will require the ASCII alphabet. Set the desired over-the-air bps rate from the operational mode menu option on the RF-5710 modem. For compatibility with stations equipped with the Northern Radio NR 3132 modem or the optional AFSK card in the transceiver and installations equipped with the MD-522/GRC FSK modem (AN/GRC-106) select the FSKNS mode on the RF-5710 at a symbolic rate of 50 bps (2805+/-42.5). In the communication software, ensure that your settings reflect the selection of the Baudot (5 bit) alphabet and ensure that you change the RF-5710's DTE settings as outlined in table 1a. For interoperability with installations equipped with the Harris RF-3466A modem or installations with the Harris RF-5000 series of HF transceivers, select any of the available FSK modes. Please note that the "Robust Serial" mode on the RF-3466A is not compatible with the RF-5710's "Serial" mode. Furthermore, the RF-5710 modem is not compatible with the 39-tone (multi-tone) format of the RF-3466 or RF-3466A modems. When selecting a modem waveform and data rate, please take into consideration the type of HF radio equipment you are using. Users have reported that they have not been able to achieve high speed transmissions (2400 bps) in the serial mode using a Harris RF-230 HF transceiver. Analysis into this problem reveals that the Serial waveforms from the RF-5710 HF modem exceeds the audio bandwidth of the transceiver. The Serial and NATO STANAG 4285 waveforms require a bandwidth of 3 kHz (300 Hz to 3300 Hz). The RF-230 transceiver is designed for a 2.7 kHz bandwidth (300 Hz to 3000 Hz) which is standard for an HF radio. The only waveforms from the RF-5710 modem which will conform to the RF-230 transceiver bandpass width are the FSK, Serial Narrowband and STANAG 4529 modes. Other modes may be employed at lower bit rates and with reduced reliability and is not recommended.